Time for another award show! This week between the Golden Globes and the SAG Awards has been filled with so much great entertainment. We had the Oscar Nominations released on Thursday, as well as The Sundance Film Festival kicking off in Park City, Utah. I'm currently writing my picks from the Wasatch Brew Pub in Park City where we have kicked off our Sundance experience filming interviews for X96. We've had a great time so far meeting a lot of great filmmakers and attending some great parties. We will post more about Sundance later this week. Now lets get to to my SAG Awards picks! There is so much great talent nominated, and I can't wait to see who wins. My Golden Globes picks did well, lets see if my SAG picks do a little bit better. Enjoy! *I picked Sandra Bullock during the Golden Globes thinking that was how the Hollywood Foreign Press would vote. Honestly, in this list I don't think that she's the best. So I'm sticking with my gut this time. I could also see Emma Thompson win for Saving Mr. Banks. *This is hard to pick. I feel like best film is 12 Years A Slave, but this is best performance by a cast in a motion picture. Taking away the story, the art, and all of the aesthetics of filmmaking and purely basing this performance by a cast, I have to pick American Hustle. *This is actually a pretty strong category. I think Claire Danes are Kerry Washington are both great contenders. However, after Anna Gunn's Emmy WIn for the role, I feel Anna Gunn is really the top contender this year for the SAG Awards. She was brilliant in the final season of Breaking Bad. *Another really strong category. I think Ty Burrell is a big contender here as well as Don Cheadle, but overall performance I think Jim Parsons wins. Interesting changes in this category compared to the Golden Globes last Sunday. *This has been the hardest category to pick so far. Every one of the women nominated for this award is an incredible actress. I keep hoping to see Mayim Bialik win an award for her role as Amy on The Big Bang Theory, but I feel this category is a little too strong for her to get a win this year. 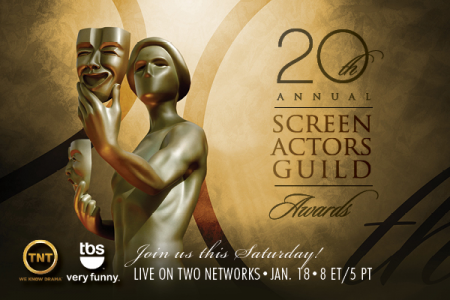 It's time now to tune into the 20th SAG Awards! Tune on on TBS or TNT starting at 8PM ET/5PM PT. Congrats to all of the nominees this year! As I continue to work on our new show The Job Interview, I look forward to joining SAG this coming year and being part of the festivities next year. Enjoy the show! I'll be watching it here at Sundance. Stay tuned for upcoming reviews, pictures, and videos from Sundance this year.